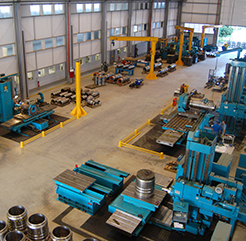 The Macaé, Brazil facility occupies 10 acres of land on which seven buildings are located: the Administrative, Finish Machine, Assembly and Test, Fabrication and Pipe Buildings, Phosphating Plant and Warehouse. Total building area of the Macaé facility equals 166,661 square feet. The Administrative Building plus separate reception area equals 5,970 square feet of office space for administrative personnel as well as financial, engineering, sales and general management employees. Dril-Quip do Brasil has two Finish Machine Buildings. Building I has 25,898 square feet of shop floor and 13,792 square feet of office space. It is equipped with two overhead cranes, both load-rated to 20-ton capacity. Building II has two bays: one with two overhead cranes load-rated to 10-ton capacity; the other bay has two overhead cranes rated to 20-ton capacity. There is 44,375 square feet of shop floor and 10,714 square feet of office space. Within the two Shops there are currently twenty machines installed and fully operational; the majority of these machines are Computer Numerically Controlled. 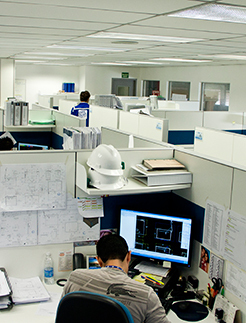 The Assembly/Test Building consists of 24,219 square feet of shop floor and 9,688 square feet of office space. The building includes a test pit that measures 15.2 meters by 7.6 meters by 9.15 meters deep, plus a 36-inch-diameter, 50-foot-deep hole for the assembly and testing of riser and other long equipment. The Assembly/Test Building is equipped with three overhead cranes rated for 50, 20 and 10 tons. Offices and shop floor space of the Fabrication Building total 18,033 square feet. The building has one overhead crane rated for 10 tons, and three jib cranes, each rated for one-ton capacity. The Pipe Building consists of 14,324 square feet of shop floor space, with pipe rails, four sub-arc weldment machines and four jib cranes rated to one-ton capacity. Inventory is stored in a 7,926-square-foot building, climate-controlled for the storage and conservation of elastomers. It is equipped with a jib crane rated for one ton to support the process of packing and shipping goods. The Coating Shop, with covered area of 1,292 square feet, is used for coating parts with zinc and/or manganese phosphate. It is equipped with the required tanks, one jib crane and a monorail overhead crane rated for 5 tons.